George Pagonis, a finalist on Season 12 of Bravo’s Top Chef, is executive chef and partner at Mike Isabella’s regional Greek restaurants, Kapnos and Kapnos Taverna. Washington, D.C.’s Kapnos put inland Greek cuisine, including daily whole animal roasting, on the map in the nation’s capital when it opened in 2013. Kapnos Taverna expanded the brand to Arlington, Virginia, and added a maritime flair to the menu with dishes exploring the cuisine of the islands and coastal regions of the Aegean. 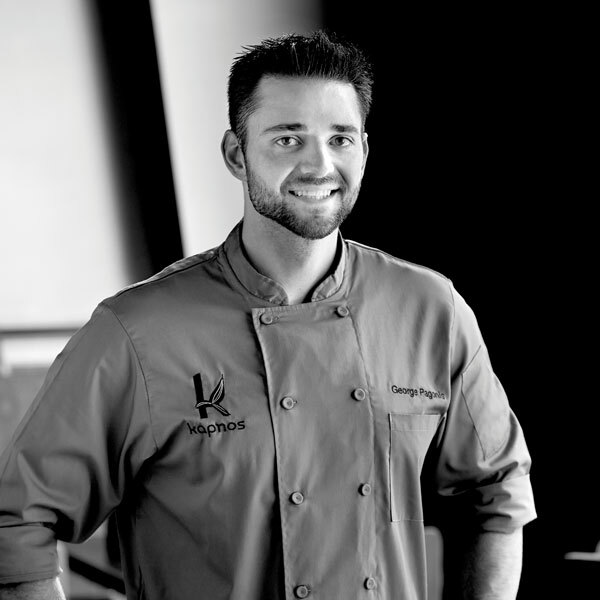 Before opening Kapnos, Chef Pagonis served as chef de cuisine at Mike Isabella’s Italian-inspired flagship, Graffiato, also in Washington, D.C. Prior to joining Graffiato, Chef Pagonis cooked at Aureole in New York under Christophe Bellanca and Marcus Ware. The fluent Greek-speaker also worked at Jose Andres’ Zaytinya, where he first cooked under Mike Isabella. His first tour of duty in a fine dining kitchen was at New York’s Le Cirque. Chef Pagonis attended the University of Mary Washington and followed that up with a degree from the Culinary Institute of America. But he first earned his kitchen stripes at The Four Seasons, an Alexandria, Virginia, Greek diner owner by his father.